Ready to sew along? 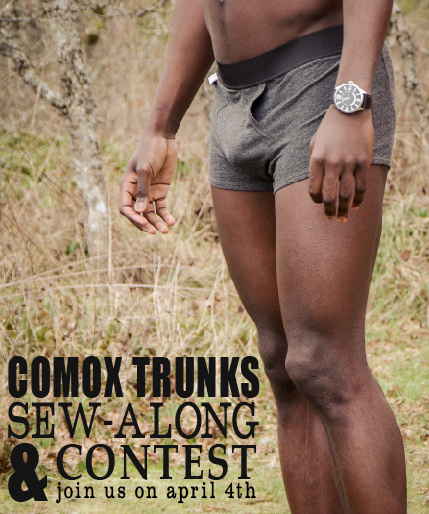 We’ll be holding a sew-along and contest for our brand new Comox Trunks starting Friday, April 4th. This will give you plenty of time to purchase your pattern and/or supplies kit. The winner of our contest (chosen using a random number generator from the selection of comments) will win a prize pack of boxer sewing goodies – a selection of elastics and a selection of great knits – and so they are ready to sew an entire underwear drawer full of Comox Trunks! Stay tuned for a sew-along schedule and photos of the prize pack! Will you be joining us? Note: Now that I’ve told you the good news, I have a slightly less thrilling announcement about the Comox Trunks sewing pattern. It has come to our attention that there was a minor error involving pattern pieces 2 & 3. We will be revising the PDF pattern shortly and will email it to everyone who has purchased it. For those of you who have purchased the tissue pattern, please refer to our Errata page on our website and please don’t hesitate to ask for clarification while you sew (simply email us at info@threadtheory.ca). We’re really really sorry about this error – we will be providing several easy cutting and sewing methods throughout the sew along for you to use if you have purchased this edition of the pattern! Categories: Comox Trunks, Comox Trunks Sew-Along, Thread Theory News | Tags: Comox Trunks Sew-Along | Permalink. Our elastic isn’t the type with one side that is extra fuzzy (as found on some ready wear underwear) but it is a knitted elastic that is quite smooth and so is comfortable to wear. We looked through all of Matt’s underwear when making our elastic choice and about half of his had this style of elastic! If you are unable to find elastic that you think would be comfortable to wear, you could always cover it with fabric by making a rectangle that is the width of the elastic plus two seam allowances and sewing it onto the waistband (I will be demonstrating how to do this for our sew-along!). Good luck! Perfect timing! My mid semester break starts on the 4th! Awesome 🙂 I look forward to seeing your trunks! If you’re ordering a kit, it will take 5-8 business days so I better push the deadline later! How about May 5th? Do you know how long the sewalong will last? I gave up fabric shopping for Lent (so, until April 20th), but I really really would love to participate on or after Easter!!! I’m glad you’ll be participating! I look forward to seeing your trunks (even if we don’t get to see the model :P).